Before I knew it we were six months on from that horrendous Saturday morning back in May where I was in horrific pain, and now I was attending an appointment at a new hospital. 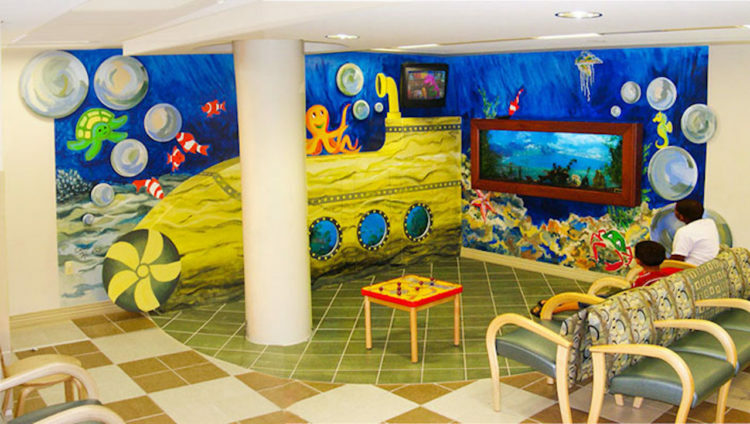 The corridors were painted with an underwater theme, sharks swam up the walls, octopi bounced above the heads of waiting patients and fish were printed on the badges of all the staff. There were games laid out in the middle of the room, building blocks, jigsaws and activity tables, but there was something about that morning that didn’t make me feel like playing. It was all thanks to my GP who brought me to this appointment. Once there was a bit of swelling around my joints, he referred me to a new rheumatologist, with the hope this would be the right path to go down. To say I was nervous was an understatement. I was worried about being poked and prodded again under close examination and feared this woman might not be any different than the other doctors who were convinced it was “all in my head.” I knew it wasn’t, but when you’re constantly told there’s nothing wrong with you, you start to question your ability to know your own body. The appointment took the same routine that all my appointments did in the years that followed; you discuss your symptoms, your background, get an examination, a new or continued diagnosis and create a plan for the next four months. The different thing about that first appointment though was the fact that for the first time I was believed when I said something wasn’t right. There is only so much you can do as an 8-year-old to convince a health specialist you’re telling the truth, when in theory they should be the one telling you what’s wrong with your body. It seemed all the hard work my family had put in to voicing all my fears, anger and frustration had paid off, as on that day I was diagnosed with juvenile idiopathic arthritis. It’s safe to say I didn’t know what it was. I knew my Nan was sick with something along those lines, but it was clear mine was different. Although I wasn’t 100 percent sure of what the future would hold or even what the next day would hold, I had come away with a new diagnosis and a new doctor, and to me that was progress. I saw the look on my family’s face that what I would have to deal with was not going to be easy. My Nan had been there and still continues to battle, but she never expected her eldest granddaughter would have to fight as well. I walked out into the waiting room back to the underwater theme, the activity benches and the swarm of nurses and realized this setting was going to be familiar for an extremely long time. The thing with a diagnosis is it’s an extremely bittersweet moment. The diagnosis is the first step to getting better but it’s also the realization that there’s something seriously wrong with your health. It’s the definitive moment that you’ll have to fight and it’s not going to be over soon. For the doctors, finding a diagnosis is often the hardest part, and from then on the healing and treatment process becomes a lot easier. For the patient, the mental battle doesn’t get easier at any stage. It’s the acceptance, the realization, then the personal struggles and the overwhelming physical pressures of it all. It’s the start of an extremely long battle.